Flammable storage cabinets help prevent the heat of a fire from reaching chemicals stored inside. Flammable chemicals become more volatile and vaporous when exposed to high temperatures. As the temperature of a flammable liquid increases, the molecules in the liquid speed up. Some acquire enough energy to escape into the air as a vapor. If the ambient temperature exceeds the flash point, the lowest temperature that the vapors of a flammable liquid will ignite when given an ignition source such as a spark, the situation becomes extremely dangerous. Certification tests measure how long it takes for the internal temperature of a flammable storage cabinet to rise to a dangerous level. The longer it takes to increase, the greater the fire resistance of the safety cabinet. This time creates a safe window for workers to evacuate area. It also helps emergency personnel extinguish the fire before the chemicals ignite. In a fire, every second matters. High-risk environments may require more time for evacuation and emergency response. Justrite® EN Safety Cabinets powered by asecos® offer extreme fire resistance of its flammable contents to provide this additional time. What is a High-Risk Environment? What Do the Regulators Say about Flammable Storage Cabinets? The highest fire-resistant standard in the world is the European Standard EN 14470-1. 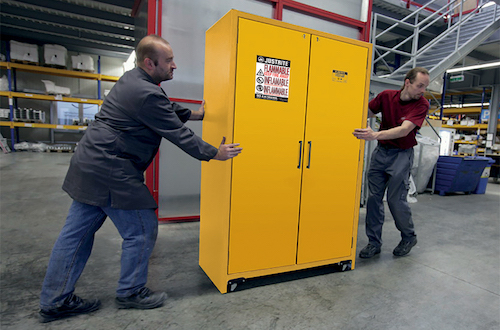 Safety cabinets sold in Germany and several countries of Europe must meet this standard by law. All 30- and 90-minute fire resistance models of Justrite EN Safety Cabinets are tested and GS certified by MPA Dresden. These flammable storage cabinets also meet the requirements of NFPA 30, NFPA 1 and OSHA. EN safety cabinets feature multiple layers of fire resistant gypsum. Mineral fiber helps achieve the longer fire resistance times. Hybrid style doors open or close manually. A damper adjusts the force necessary to open the doors. Each door has an independent cylinder-lock to protect against unauthorized use. Fusible links are a key safety feature. The links melt at 122 F (50 C) allowing automatic closure of doors in fire conditions. Air vents are mandatory according to EN 14470-1. Justrite EN Safety Cabinets are supplied with flame arrestors and caps for FM compliance. Vent butterfly valves close securely at 158 F (70 C) to shut off air supply and exhaust during a fire. For additional protection, intumescent strips expand and hermetically seal all gaps during a fire to reduce heat entering the cabinet. Haz-Alert™ reflective warning labels are highly visible under fire conditions or power outages. They reflect the light of flashlights used by emergency responders. Justrite EN Safety Cabinets for fire protection when storing flammables in high-risk environments are available in 30- and 90-minute models. Find out more about all EN flammable storage models.